Batch-apply advanced visual features to PDFs. Is there a better alternative to WatermarkPDF? Is WatermarkPDF really the best app in Applications category? Will WatermarkPDF work good on macOS 10.13.4? WatermarkPDF is a simple and intuitive application for applying text, image, color and texture watermark on PDF documents in batch fashion. 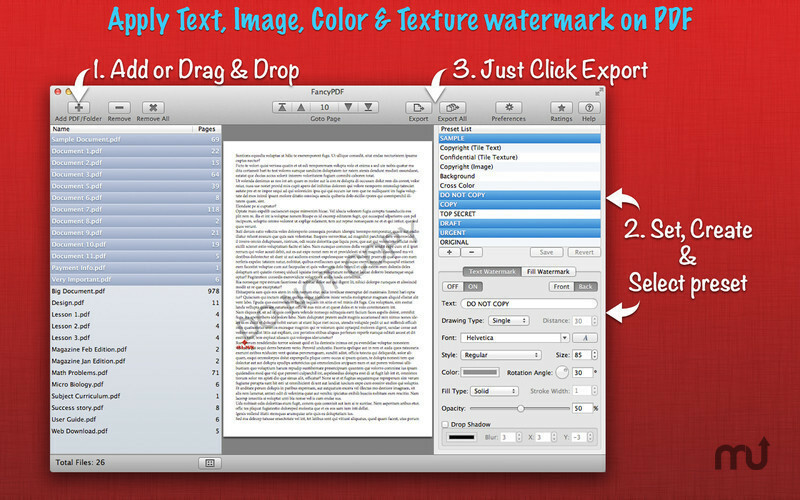 FancyPDF provides easy and effective ways to apply watermark with extensive set of options and presets. Personalize your PDF by batch exporting multiple watermark presets on a PDF, each PDF will be watermarked with individual preset options. FancyPDF makes your life easy by defining true means of batch exporting PDF files with watermark, batch exports multiple PDF files with multiple watermark presets at once. Fully compatible for macOS 10.13 High Sierra. WatermarkPDF needs a review. Be the first to review this app and get the discussion started! WatermarkPDF needs a rating. Be the first to rate this app and get the discussion started! Batch export list of presets on a set of PDF files to generate each PDF with individual watermark. 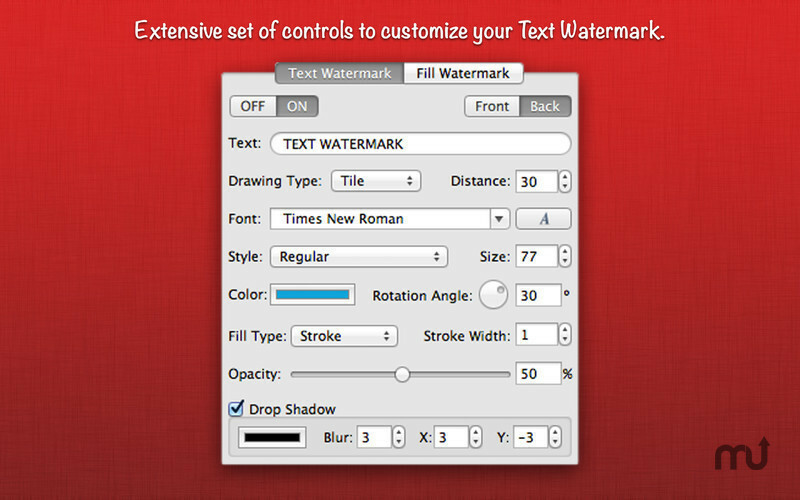 Customize your Text Watermark by changing drawing type (Single, Double, Triple and Tile), font, size, color, opacity, angle, fill type and drop shadow. Customize your Fill Watermark by choosing Color, texture or custom Image and set size, opacity and drawing type (Single, Center, Fit to Page, Stretch to Fill Page, Cross, Tile). Real time preview of PDF with watermark Any change in control settings reflects in preview. 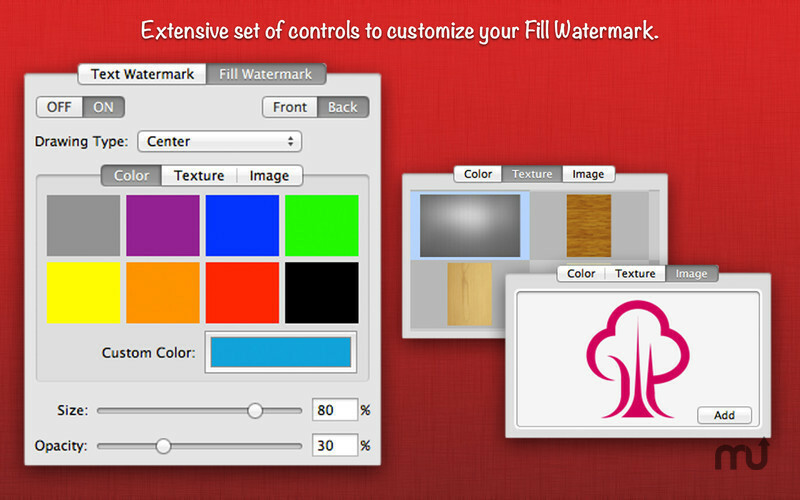 Save and preserve your favorite customize watermark settings as preset. 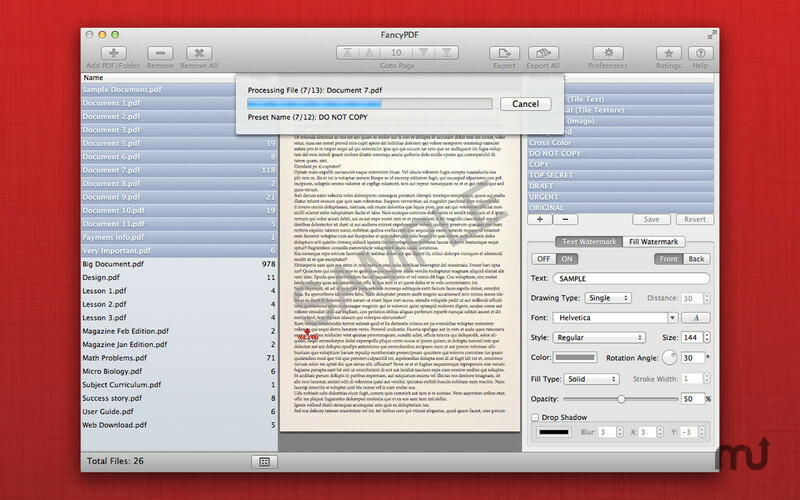 Export your PDF file using High, Medium and low compression quality to reduce PDF file size. Export as encrypted PDF by setting password protection. Preferences options to customize output PDF file name with preset name. Option to create separate folder for each watermark preset.